This functionality is available in the Gantt PRO edition only. 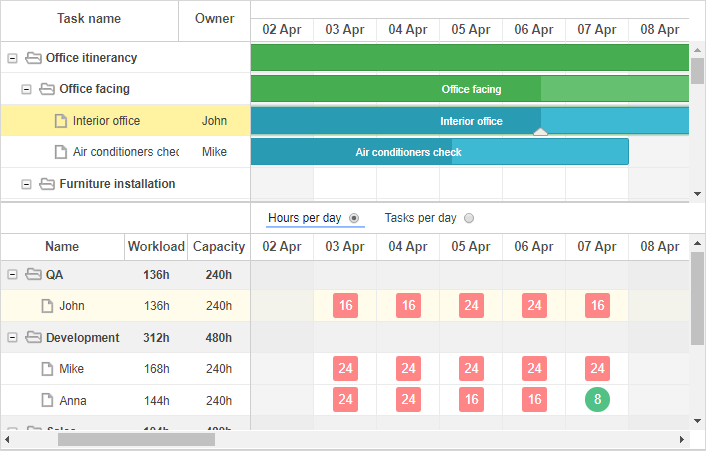 Gantt provides predefined resource views for highlighting resource load, methods for breaking project down by a resource for load balancing, task and resource-specific work-time calendars, as well as public API for implementing any custom behavior. You can use this format with the custom multiselect control. The resources are assigned to the Task1 as follows: the resource with id=2 - in the quantity of 8 units, while the resource with the id=3 - in the quantity of 4 units. This format is supported by the Resources Control of the lightbox. When sending data to the server, DataProcessor serializes the values of the described properies into JSON. To process such records on the server with ease, make use of the "REST_JSON" dataprocessor mode. There is a shorthand for getting all tasks assigned to a resource - getResourceAssignments. Resources can be assigned to any property of the task object using the built-in lightbox. If you define resources via the serverList collection, they can be loaded together with the rest of the data, otherwise you'll need to load them manually. 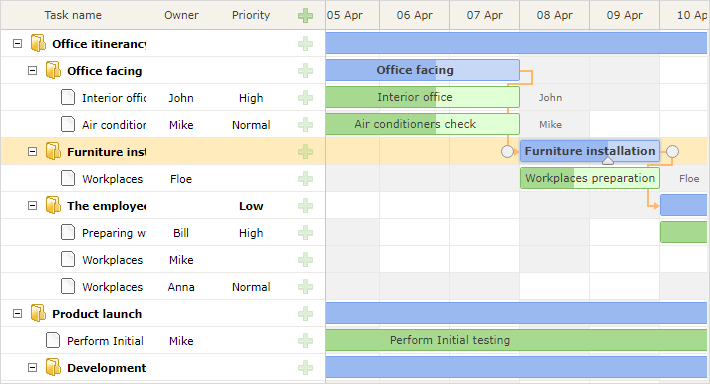 Gantt supports the custom work-time calendars feature. Work-time calendars can be associated with specific resources. You can get more information in the related article. You can use the grouping extension to break down the whole project by the resource property. This feature can be used for balancing resource load in the calendar. Read more about task grouping in the related article. In case you assign several resources to a task, tasks will be grouped by assigned resources. It means that a task assigned to two persons won't be duplicated for each of them. Instead it will be rendered once with both persons assigned to it. Note that grouped tasks will be sorted by the start date. 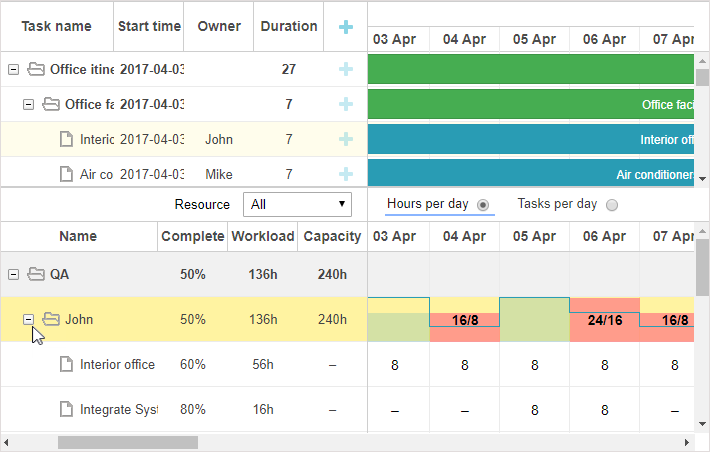 If tasks in the loaded data set have several resources assigned to them, Gantt will create groups for them automatically. 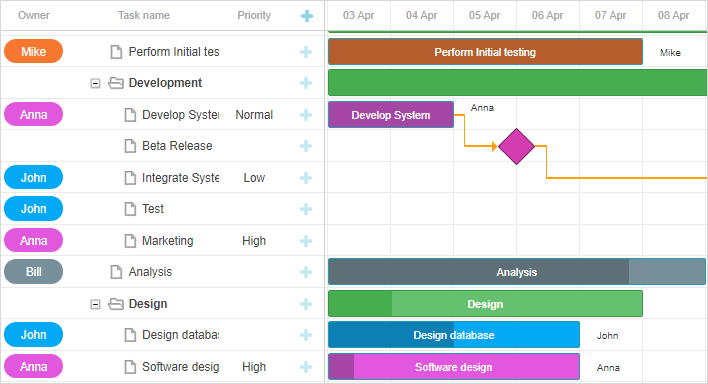 For tasks without asssigned resources Gantt will create the default group Not assigned. In case there is such a group in the data set that is passed into the groupBy() method, it should have the default:true config specified to prevent automatic creation of a such a group. Please note that dragging of tasks grouped by multiple resources is impossible. dhtmlxGantt has two types of predefined layout view for displaying resource load of gantt: resource load diagram and resource histogram. It includes corresponding views for the grid and timeline: "resourceGrid" and "resourceTimeline". background rows, which inherit task_row_class and task_cell_class. The templates of resourceTimeline can be redefined at the layout level. 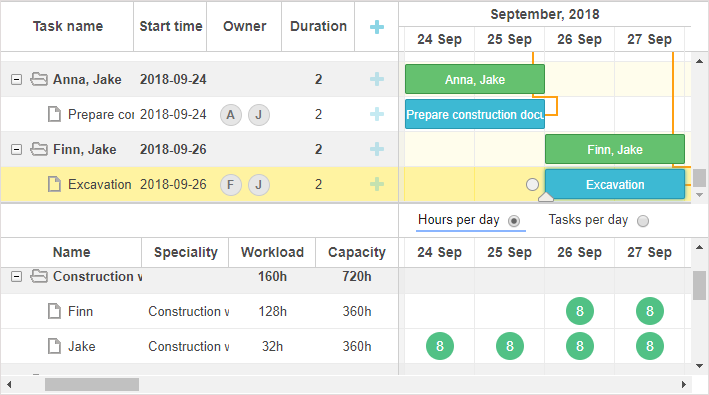 This type of the layout view for displaying resource load of gantt includes the "resourceGrid" and "resourceHistogram" views for the grid and timeline correspondingly. histogram_cell_allocated - the height of the filled area in the histogram. Its value can be set from 0 to maxCapacity *. histogram_cell_capacity - the height of the line that defines the available capacity of the resource. Its value can be set from -1 to maxCapacity *. Values less than 0 won't render the line. Thus, if the templates histogram_cell_allocated or histogram_cell_capacity are set to value 24, it implies the highest point of the row. Capacity defined at the resource level overrides the global capacity of histogram for a given resource. By default both views (either "resourceGrid" and "resourceTimeline" or "resourceGrid" and "resourceHistogram") will be bound to the data store named as specified in the gantt.config.resource_store configuration option. 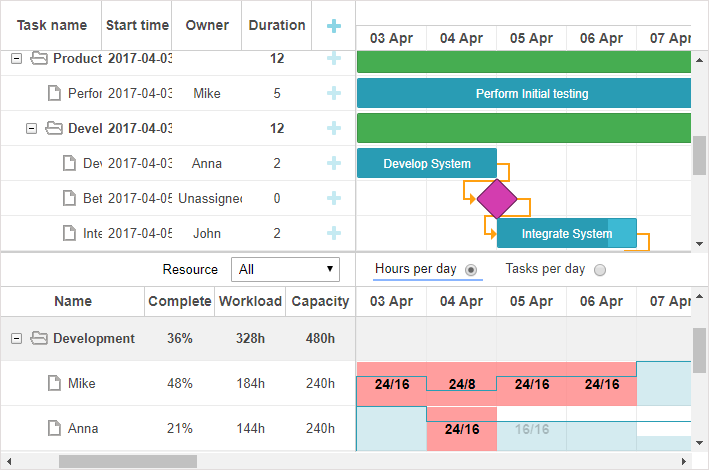 With the fetchTasks property set to true, Gantt renders all tasks assigned to a certain resource in the resource view panel. This functionality works both for the resource diagram and resource histogram types of layout.